Brilliant & bright red roses about 2" in diameter. Wonderfully fragrant with a sweet mild taste. Embellish green salads. Great garnish for desserts & cocktails. Add color to fruit & cheese platters. Perfect for your holidays appetizer trays. Also available in a Mini size, a little larger than a quarter. 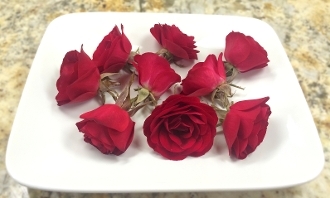 If you would like the Mini Red Roses, please write that in the "special instructions" box.